AWS IoT is a managed cloud platform that lets connected devices easily and securely interact with cloud applications and other devices. AWS Lambda is a compute service that runs your code in response to triggers and automatically manages the compute resources for you. 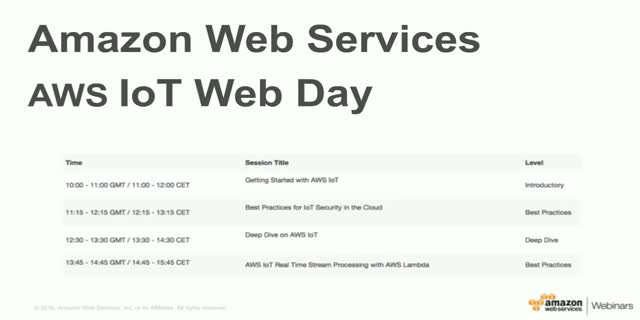 This webinar will familiarise you with the basics of using AWS Lambda to do real-time stream processing with data from AWS IoT. We will discuss how you can leverage AWS IoT to receive data and send commands to IoT devices in real-time. You will learn how to trigger AWS Lambda functions to process inbound data from your IoT devices. You will also learn how to use Lambda to connect with Amazon Kinesis Firehose to load streaming data into Amazon S3 and Amazon Redshift.